This eBook provides the basics of how informal learning differs from formal learning and the benefits it offers to both learners and organizations. Then, it outlines how informal learning happens in the workplace and how this can be leveraged. This section provides basic information on what informal learning is and how it differs from formal learning. It also outlines why it is important to evaluate Informal learning in the workplace by looking at the various ways we learn (specifically, through the 70-20-10 model for Learning and Development). This section looks at certain myths associated with informal learning and if it truly works. It then moves on to outline the benefits informal learning offers to learners and organizations. This section showcases the ways in which informal learning can happen in a workplace. More specifically, it outlines how you can leverage on informal learning in your eLearning programs. This section provides practical cues on how exactly can you use microlearning to promote informal learning in the workplace. It includes a definition of 6 microlearning formats and how they can be used. It also includes supporting examples for each format. Learners do not like the associated pressure of tests, scores, and completion within a stipulated time. Informal learning has none of these characteristics. Instead, it allows learners to have a more fulfilling and meaningful learning experience. The concept of informal learning is appealing to all sides. If a program not so uptight and the conditions that shift the mood from "working" to something different can deliver the online training objectives, then who would object? 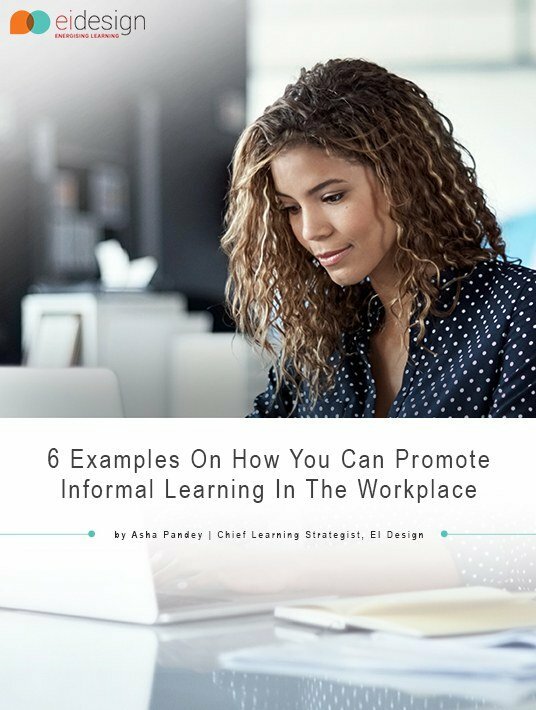 This eBook by El Design, "6 Examples On How You Can Promote Informal Learning In Workplace", offers insight on what informal learning is, how it works, and what advantages can be gained from it, together with examples on how to implement it.